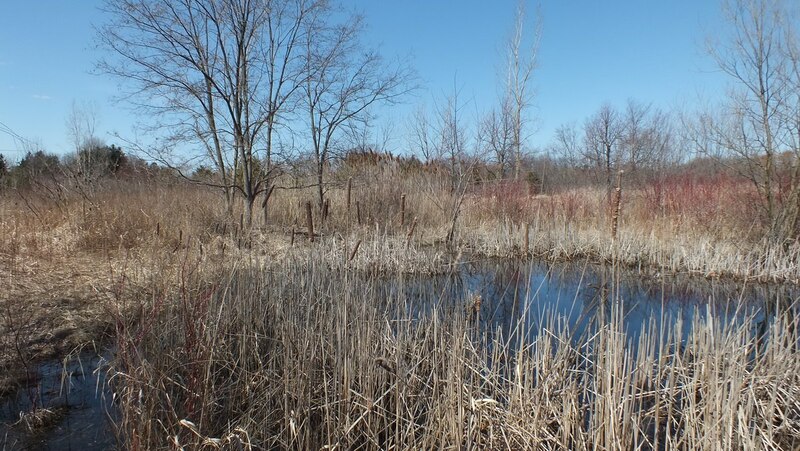 As Bob and I so often do, we walked to Toronto’s Milliken Park one afternoon in early spring. 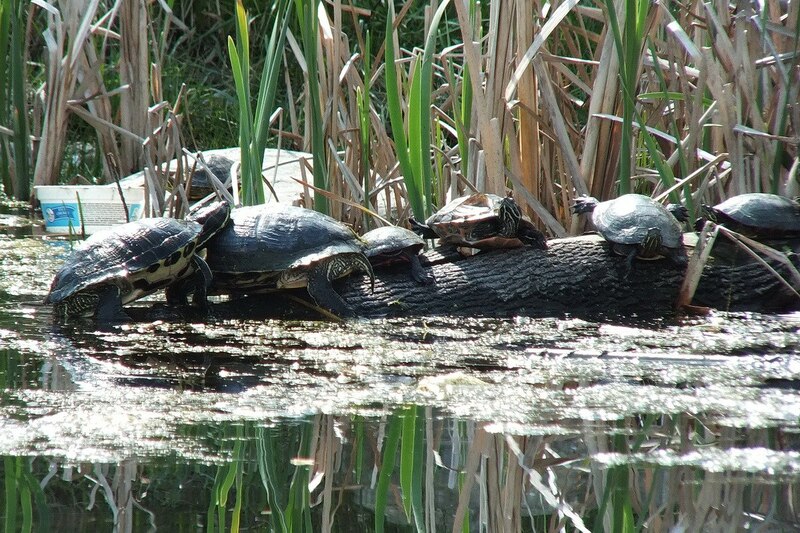 It was an unusually hot day which explained the assembly of turtles basking in the sun at the side of the park’s largest pond. 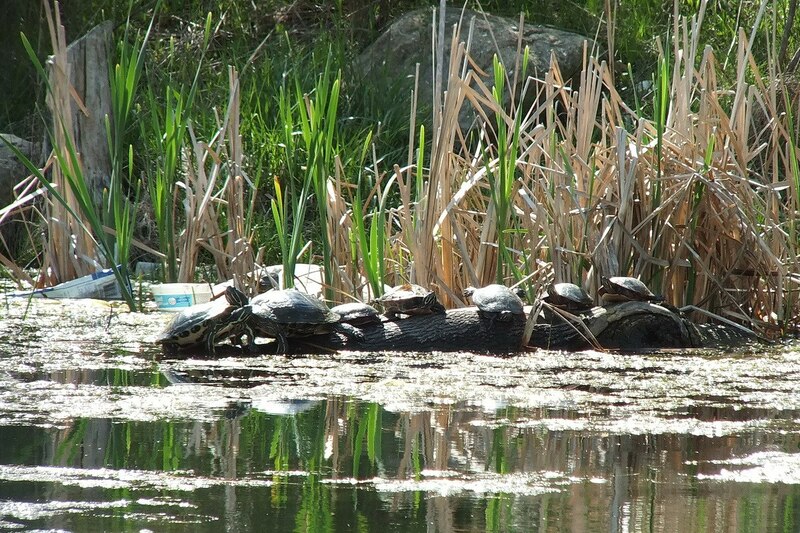 I couldn’t help think of the adage, “get your ducks all in a row” because there were the turtles, all lined up in order. They certainly occupied every inch of available space on that log. 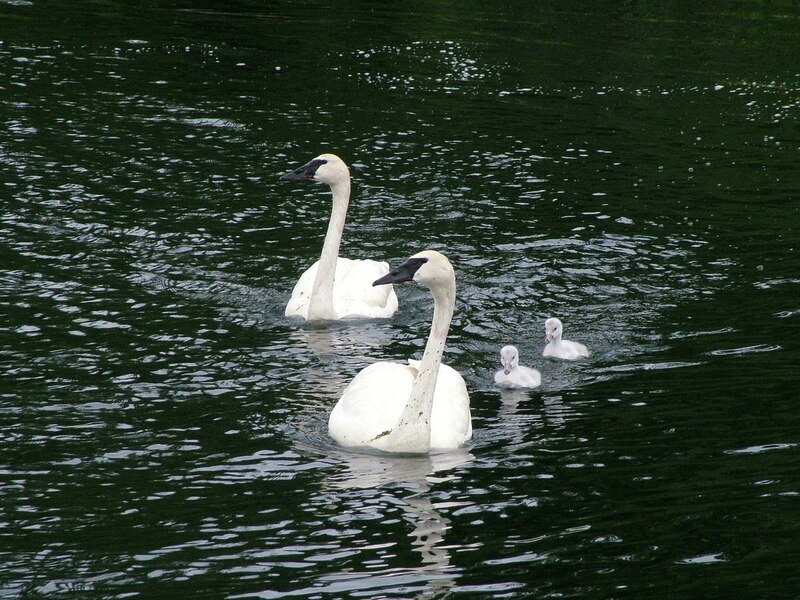 and even hosts a family of Trumpeter Swans. 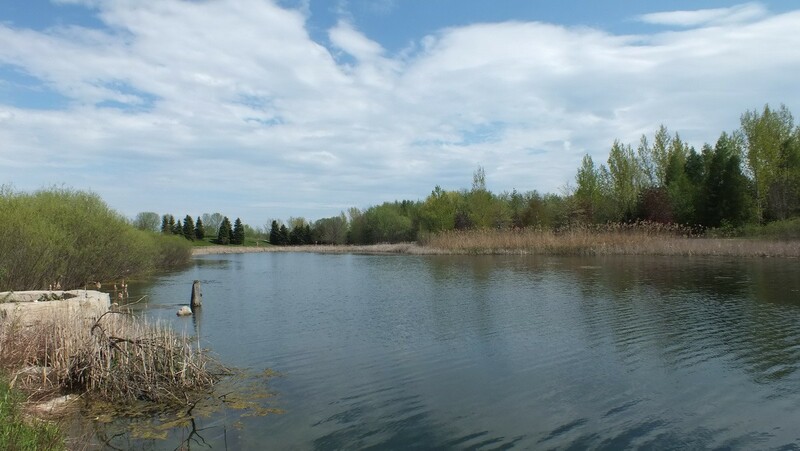 On that spring day, Bob and I decided to walk the perimeter of the pond, and took note of several species of birds in the trees lining the shore as well as in the bulrushes at the eastern end of the pond. 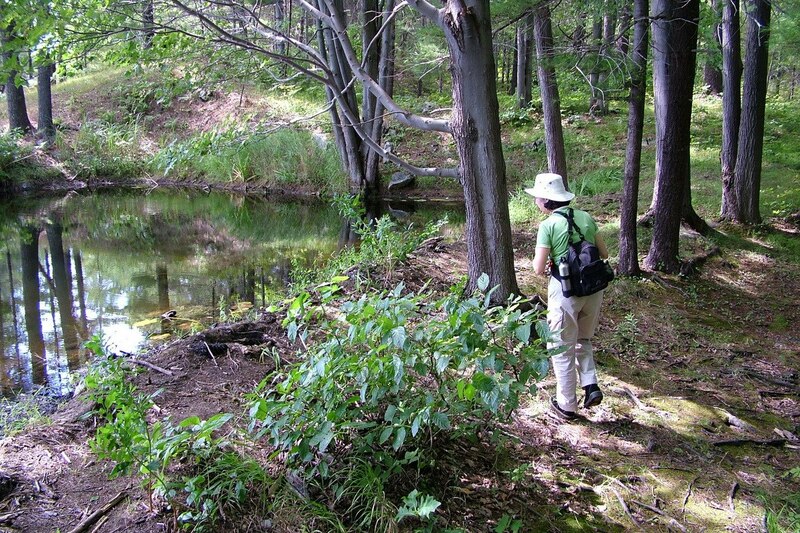 The pond sits next to a small woodlot wherein live gophers, rabbits, squirrels and raccoons. 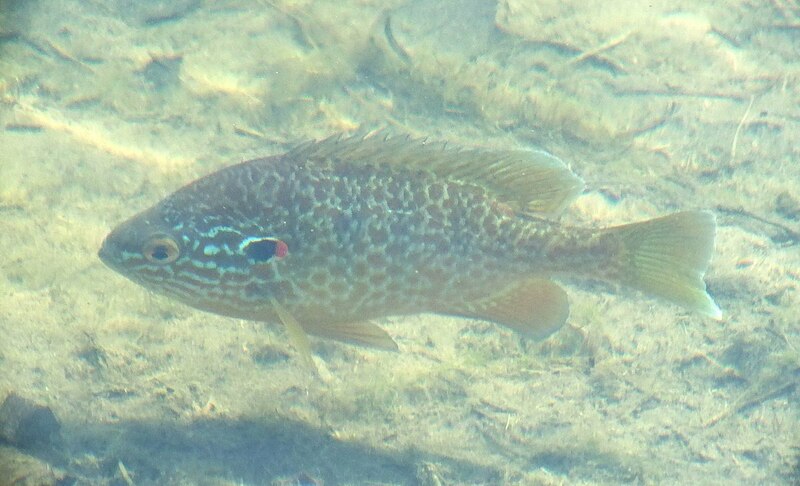 In the shallows, numerous Pumpkinseed Fish (Lepomis gibbosus) darted between strands of lolling water plants. Sunlight penetrated the water and highlighted the blue fringe at the end of the fishes’ delicate tails, and even made it possible to see the colourful spot at the edge of the gill. Pumpkinseed Fish are a type of sunfish. 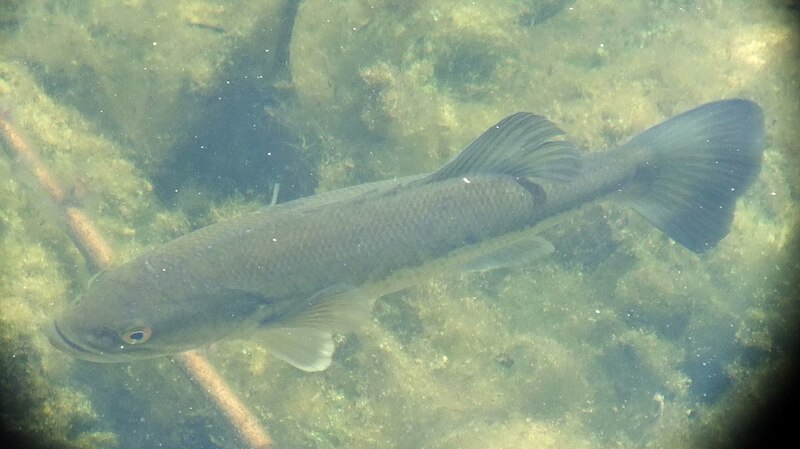 Other fish were also cruising the edge of the pond, and we are told that this one is a Large-mouth Bass. A large population of koi, a non-native species, inhabits the pond, and apparently, Large-mouth Bass actually help keep the koi under control. 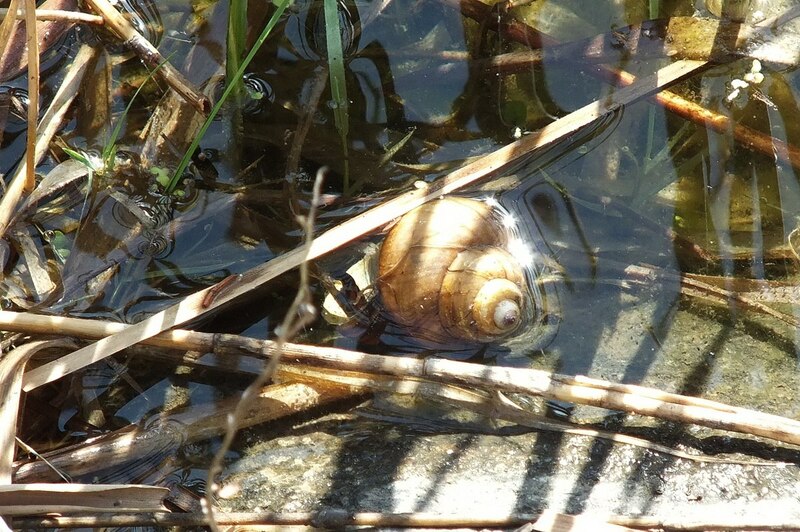 Even an over-sized snail shell languishing at water’s edge had a story to tell. Did a wayward snail fall prey to some bird or animal? It is unlikely that it would choose to sit in the pond water of its own accord. Bob and I were thoroughly enjoying our slow and deliberate progress around the shoreline. 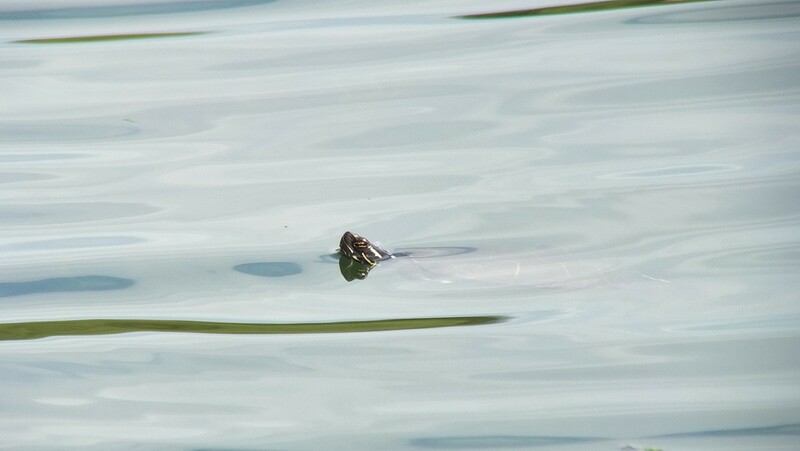 We even spotted two different turtles swimming just below the surface of the water. We took comfort in that observation thinking it was a further sign of a healthy ecosystem and proceeded towards the western end of the pond. It was there that Bob and I could see the gleaming shells of numerous turtles sitting on a log. We were thrilled to see such a thriving community of these reptiles right here in the city of Toronto and were keen to report our sightings to the appropriate people. Afterwards, we contacted the Toronto Region and Conservation Authority with our exciting report about so many “Painted Turtles”. 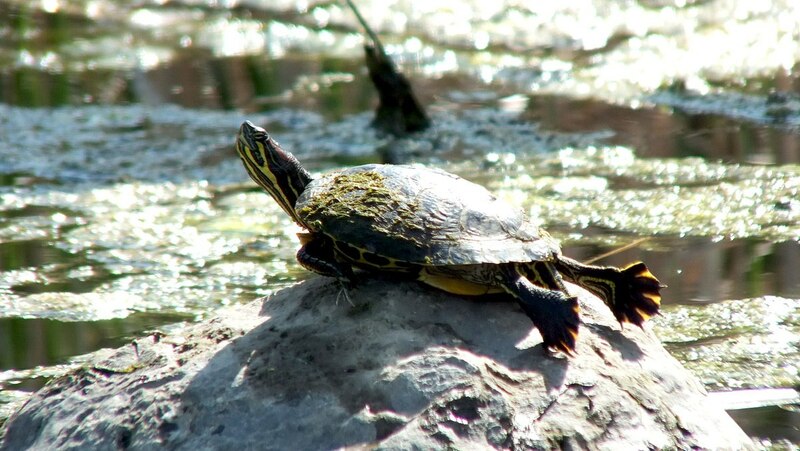 With the help of experts at the TRCA, and both Jon Clayton, an Aquatic Biologist, and Heather Lynn, a Natural Heritage Ecologist, at Credit Valley Conservation, we soon learned that not all of the turtles at Milliken Pond are native species. 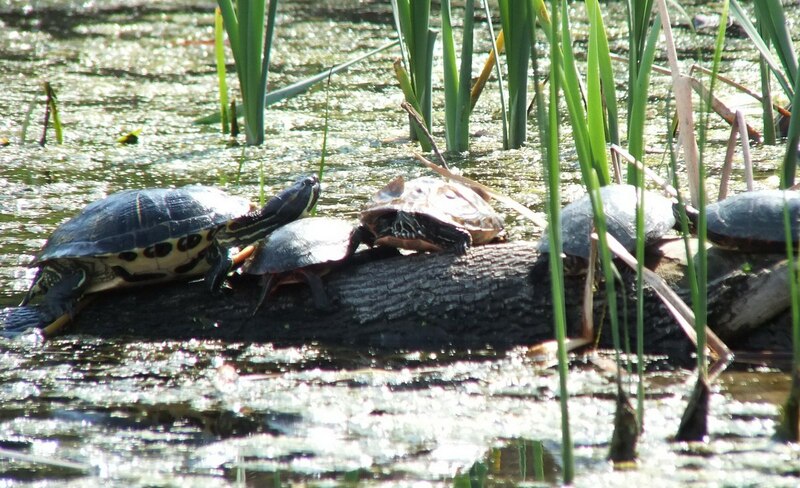 In fact, a good number of the turtles that Bob and I saw were Red-eared Sliders (Trachemus scripta elegans), a non-native species originating in the southern United States. We had never heard of this type of turtle before. 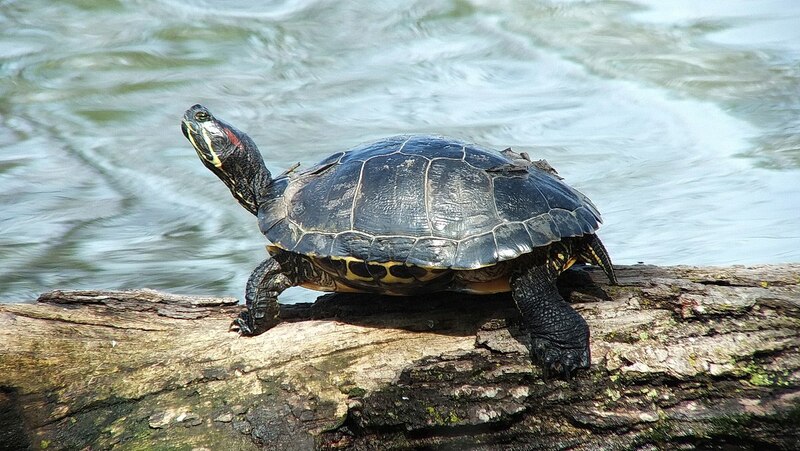 Red-eared Sliders, so named because of the red band behind the eye, are showing up in natural habitats because irresponsible pet owners choose to release their pets when the turtles become too large or the people no longer wish to care for them. 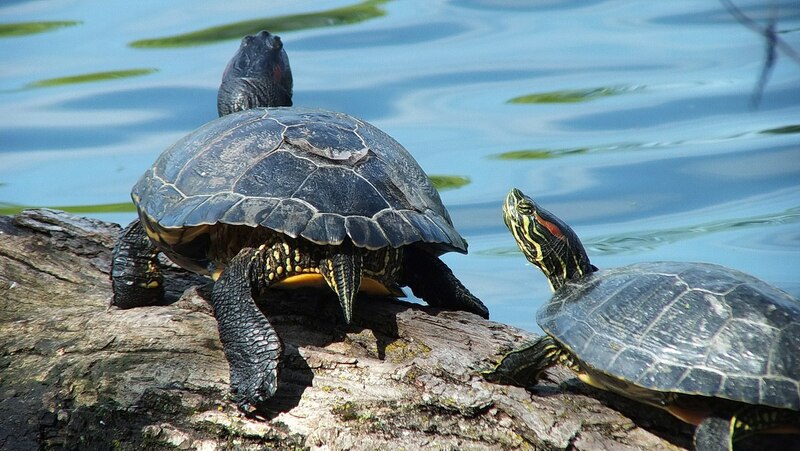 Red-eared Sliders compete with native turtles for food and basking sites and may carry diseases that infect native species. They can also occupy areas that are favourable nesting and over-wintering sites for native turtles causing a lower survival rate for the indigenous species. 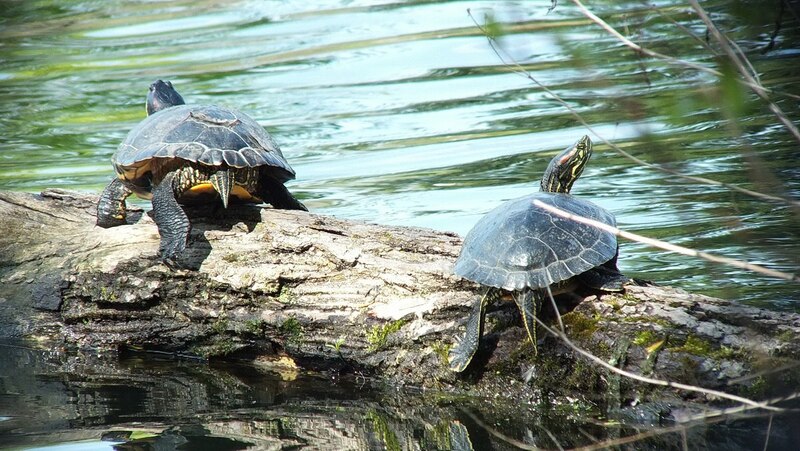 As Bob and I soon saw, the Red-eared Sliders were quite numerous. This one seemed to relish the warm rays of the sun as it stretched out atop a rock. The experts helped us identify some of the turtles as Yellow-bellied Sliders, another non-native species that has been introduced illegally into natural bodies of water. So when the expert from the Toronto and Region Conservation Authority got back to me with positive identification on the various turtles in our pictures, I was ecstatic to learn that some of them are, in fact, native Midland Painted Turtles (Chrysemus picta marginata). 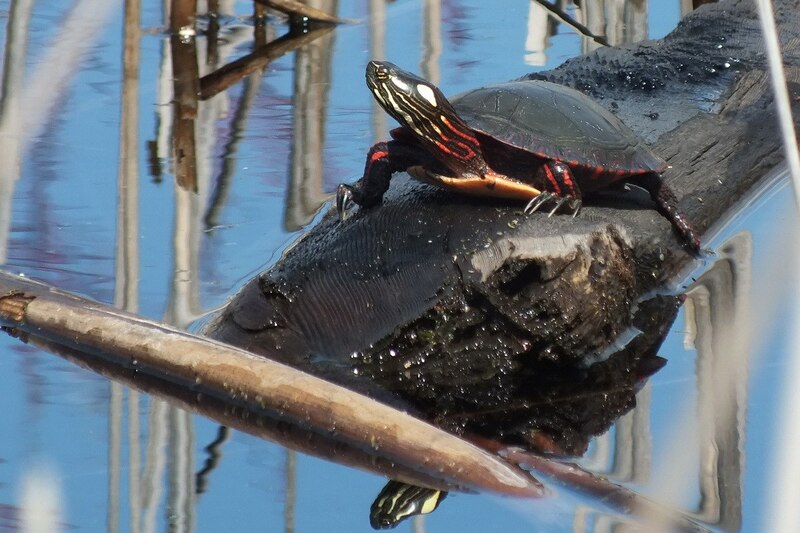 Midland Painted Turtles have yellow bands behind their eyes, and although not quite visible in this photo, their shells have red scales around the edges. Their necks, legs and tails are striped with yellow and red. As Bob and I observed the reptiles, they vied for space on the partially sunken log and were quick to mount any surface that afforded a dry spot whereon to sun themselves. Here, we are looking at 2 Red-eared Sliders and one Midland Painted Turtle. There were turtles everywhere. We must have counted at least 15 at pond’s edge or swimming near the surface of the water. 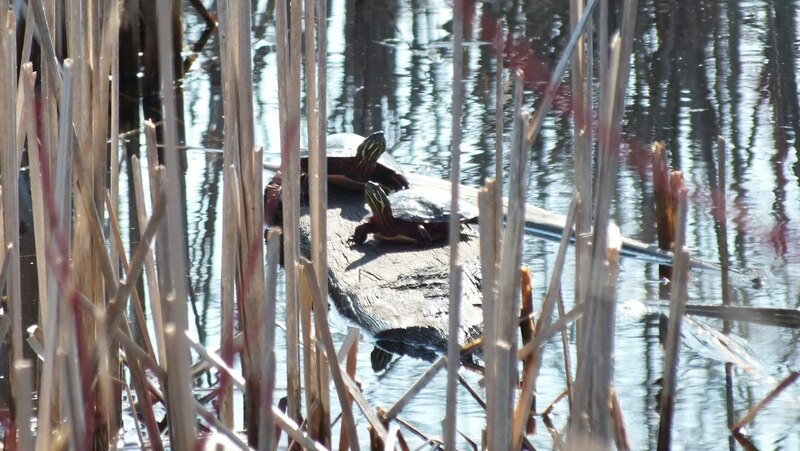 Earlier in the spring of 2013, Bob and I had occasion to observe wildlife in another park in Toronto, and there, we also saw two Midland Painted Turtles. They were making their home in a small pond located on a breakwater near the shore of Lake Ontario. Bob and I were tracking a mink at the time, when it led us to this out-of-the-way pond. 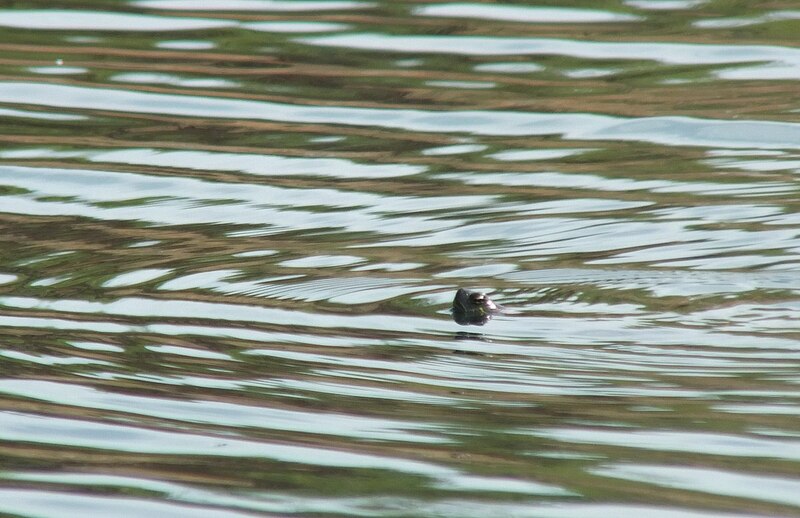 While scanning the perimeter of the pond for signs of the mink, we noticed two turtles swimming just below the surface of the water. The pair made for a floating log and promptly hauled themselves up onto it. 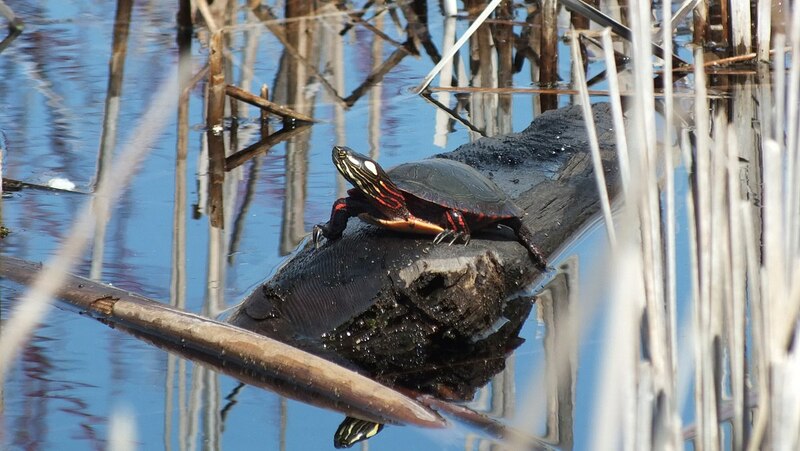 The red and yellow stripes on the neck and legs are quite striking, but it is the red markings on the sides of the shell (carapace) that distinguishes Midland Painted Turtles from other Ontario turtle species. A male painted turtle has very long nails on its front feet, and like all pond turtles, the feet are webbed to aid in swimming. In the summer of 2012, while leisurely dangling my feet in the waters of Oxtongue Lake, I was taken aback when a huge Snapping Turtle (Chelydra serpentina) emerged from beneath my dad’s dock. My squeals alarmed the turtle as much as it frightened me, but the Common Snapping Turtle is no threat to people when in the water. 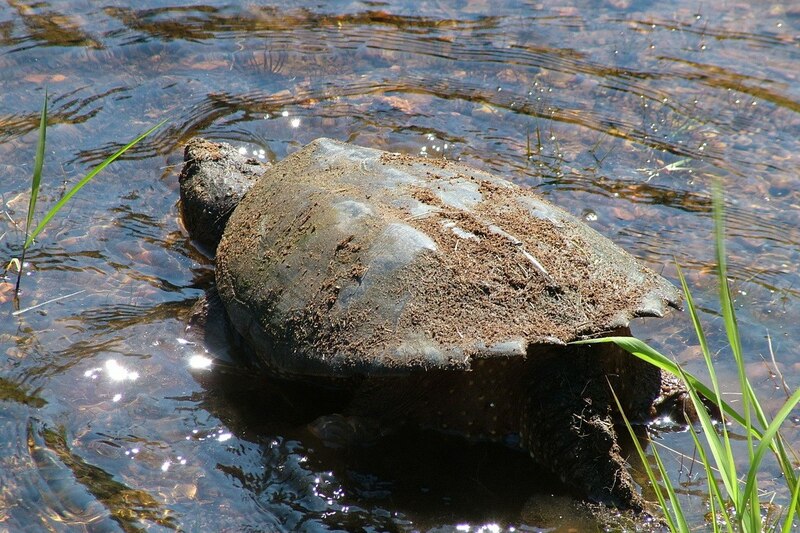 If a Snapping Turtle is threatened when on land, however, it is quite a different story. They have fierce dispositions, and their defense mechanism is snapping with their powerful, beak-like jaws. 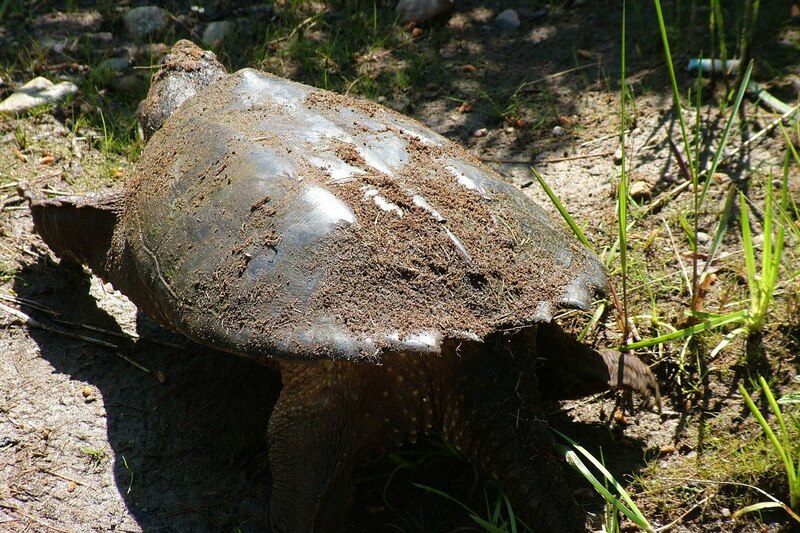 That ability has evolved because Snapping Turtles are too large to hide in their own shells when confronted. Neither Bob nor I wanted to mess with the turtle knowing that it has a highly mobile neck and head enabling it to reach back as far as the tail. The tail, itself, is as long as the carapace and is studded with dinosaur-like triangular scales projecting from the upper side. These two facts mean that the Common Snapping Turtle is quite capable of inflicting serious injury. We were happy when it decided to return to the waters of the lake. Another species of turtle that Bob and I have been fortunate enough to see in its natural habitat is a Blanding’s Turtle (Emydoidea blandingii). 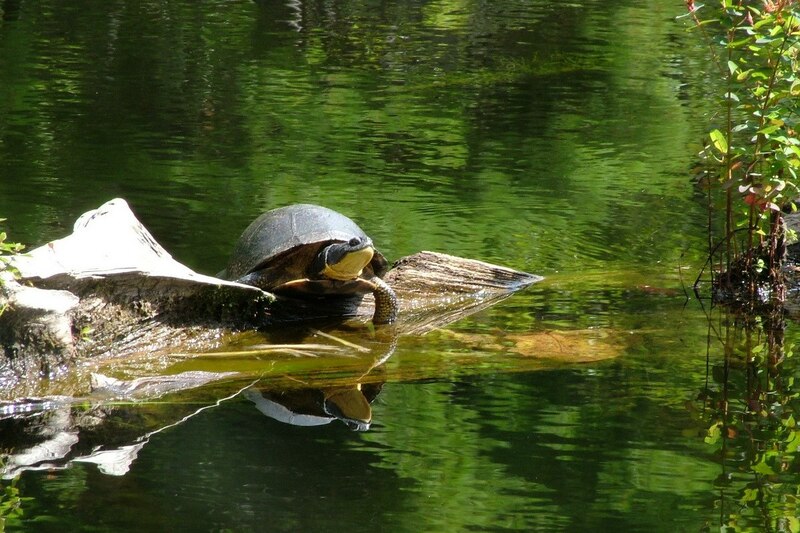 The characteristic domed shell is very obvious when the turtle is basking on a log. 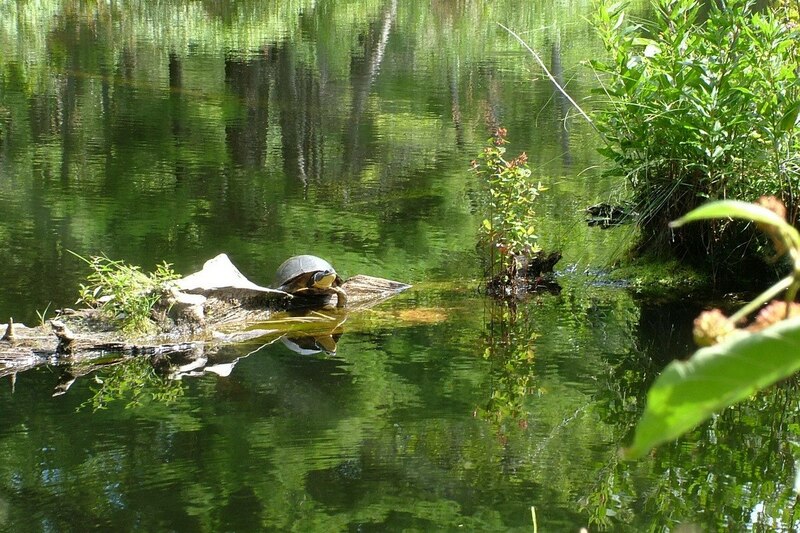 It was while hiking in Frontenac Provincial Park a couple of summers ago that Bob and I spotted the turtle in a beaver pond alongside the trail. 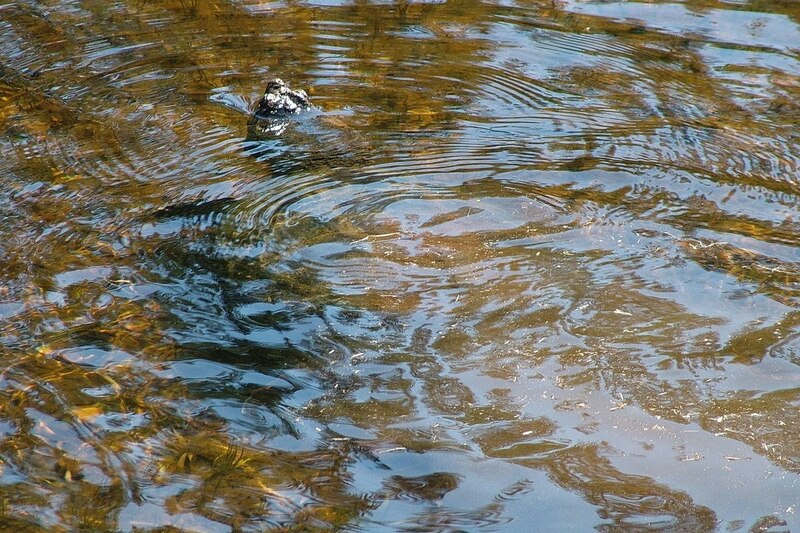 We feel very lucky, indeed, to have seen one of these endangered turtles. What distinguishes a Blanding’s Turtle from other species of turtles is the bright yellow chin and throat, but the protruding eyes are also noteworthy. 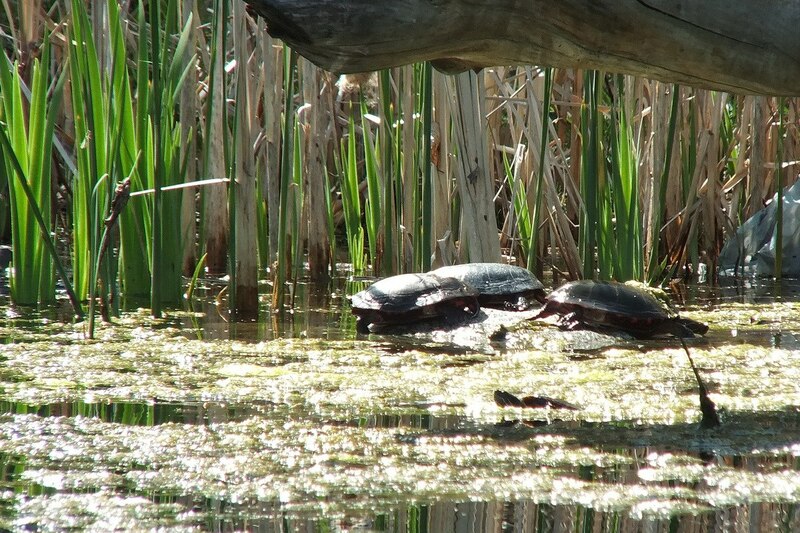 So now that Bob and I have come to understand the threat that non-native species of turtles pose to our native species, we have a real concern for the survival of the Midland Painted Turtles at Milliken Pond. If you have a pet turtle you no longer wish to keep, and you live in the Toronto area, please check out the following Toronto Zoo link: Turtle Foster Homes. 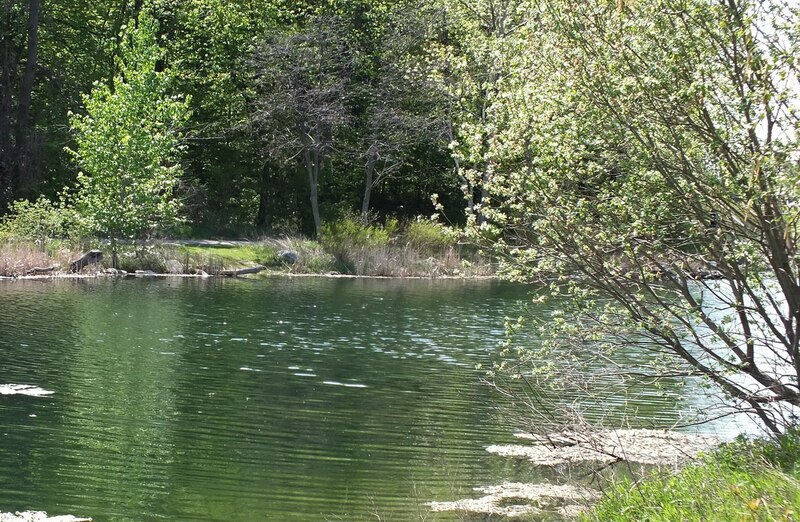 You need to visit Oakbank Pond on Center Street between Baview and Yonge. At least 4 snapping turtles, plenty of painted turtles, red eared sliders and for sure one single map turtle (he’s been shy lately). There’s plenty of goldfish that keep the Osprey and Tern’s well fed too. Spectacular fishing shows are put on daily. Thanks for the tip! We will plan a visit to Oakbank Pond in the near future. I am keeping my fingers crossed that we will get to see the Map Turtle. That would be a new one for us. …a great photo and story share from our fan Bob! Fantastic photos! Yes, sadly there are many non-native species out there. But incredible shots! The photo of the Blanding’s turtle is perfect. Those turtles are very photogenic. Great shots! Thanks for sharing! Blanding’s turtle is only semi-aquatic, and it is listed as endangered by the International Union for Conservation of Nature. The major threat is habitat fragmentation. But the snapping turtle is now found west of the Mississippi River. They have been trying to find their nest, and destroy them. But it is too late, they are now entrenched. So they are an easterner, that will become as environmentally destructive as the bull frog. 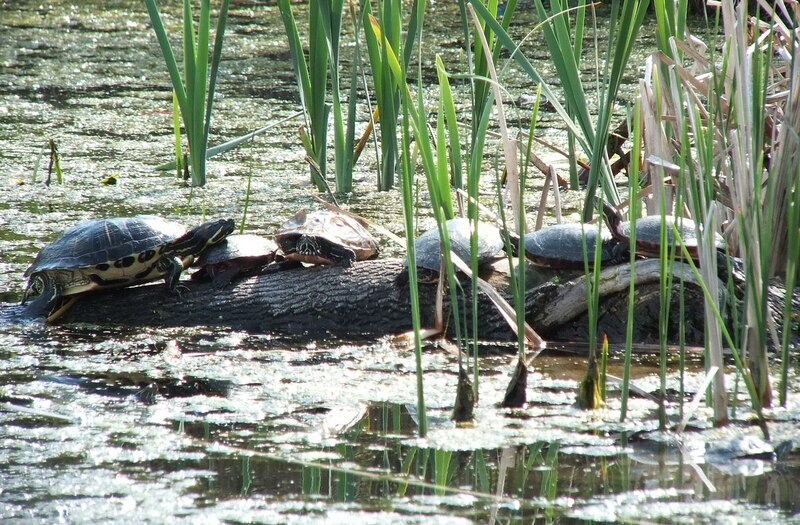 Native turtles found west of the Mississippi River, are now endangered due to bull frogs eating the hatchlings. So they have to be captive breed, and released when they reach a certain size, so bull frogs cannot devour them.